Home what is the concept of accounting? As we know that accounting is the language of business, which communicates the position of a business houses to the outside world. 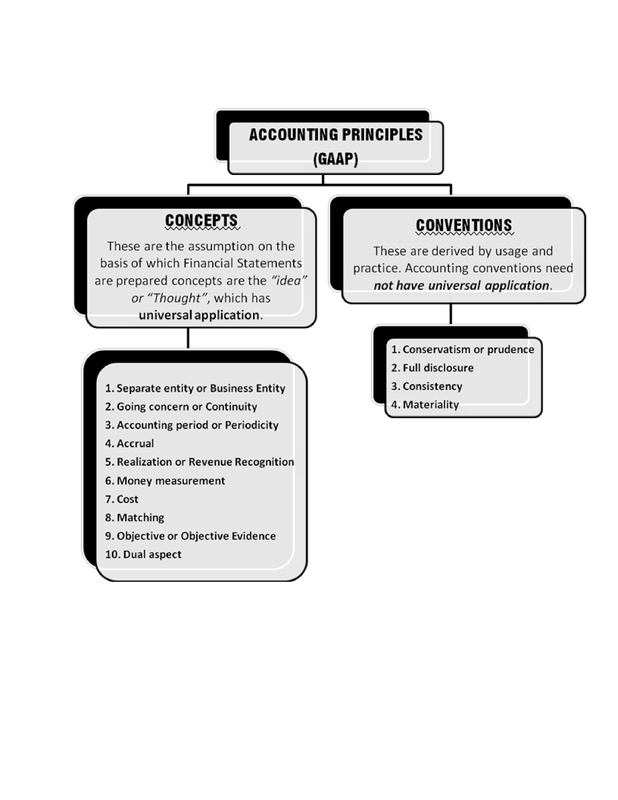 In order to make this language easy and commonly understandable by all, it is necessary that it should be based on certain uniform doctrine and standards are known as accounting principles. 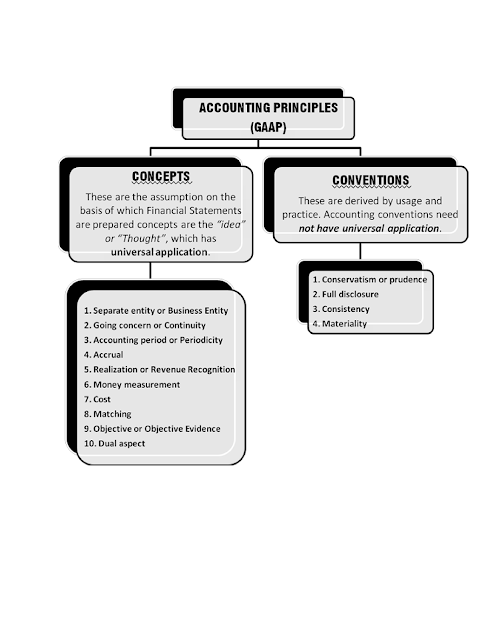 Thus, Basic accounting principles may be defined as those rules doctrine and standard which are followed by all the accountants universally at the time of recording business transactions and events. According to this concept, business and businessman, both should be treated as separate entities at the time of recording transactions in the books of business. This concept makes it possible- Account Books in Name of Business Entity Records only Transactions of Business Entity Not to record the private transactions of business in the books of business, Recorded from View-Point of Business To record the transactions between businessman and business To present the true fair view of the business affairs. Why this concept? Thus, if this concept is not followed, then the private transactions of the proprietor will be mixed up with the transactions of business and then, the true and fair position of the business could not be known. That is why, when one person invests Rs. 1,00,000 into business, it is deemed that the proprietor has given that amount to the business and therefore, this amount is shown as a liability in the books of the business. In case, the proprietor withdraws Rs. 20,000 from the business, it will be charged to him and therefore, the net amount payable by the businessman will be shown as Rs. 80,000. Confliction with law: The concept of separate entity is applicable to all forms of business organizations. The relationship, created by law between business and businessman, should not be taken into consideration at the time of recording transaction. For example, in case of a partnership business or in case of a sole proprietorship business, the partners or sole proprietor are not considered as separate entities in the eyes of law, but for accounting purposes they will considered as separate entities. Accountants treat a business as distinct from the persons who own it. But according to law business and the proprietor are one and the same. According to this concept, all the business transactions are recorded in the books of accounts from the view point of the business only. Business transactions are recorded in the business books of accounts and owner’s transactions in his personal books of accounts. Since distinction is made between business and owner, it becomes possible to record transactions of the business with the proprietor also. Without such a distinction, the affairs of the firm will be all mixed up with the private affairs of the proprietor and the true picture of the firm will not be available. The Going Concern Concept is the basic idea the business will continue for a long time, followed by all accountants, while recording and reporting the business transactions. As per this concept, unless otherwise known it is assumed that the firm is a going concern and its business will continue for an indefinite time. A firm is said to be a going concern, if there is neither intention nor necessary to wind up the affairs of business or substantially curtail the scale of its operation. It is due to this concept that: Proper distinction is made between capital and revenue expenditure Assets are classified into current assets and fixed assets, Liabilities are classified into short-term liabilities and long term liabilities, Use its fixed Assets till the end of their useful life, Carry forward (Defer) expenses or income to future years. (Expenses useful for 2 or 3 years are taken as deferred revenue expenditure), Repay its long-term loans, Expenses useful for many years are treated as fixed assets, to be written off, not in the year of purchase, by way of depreciation over its useful life. ë REMEMBER Going Concern Concept is one of the Fundamental Accounting Assumptions. The financial statements are normally prepared on the assumption that an enterprise is a going concern and will continue in operation for the foreseeable future. It is assumed that the enterprise has neither the intention nor the need to liquidate or curtail materially the scale of its operations. If such an intention or need exists, the financial statements may have to be prepared on a different basis and, if so, the basis used is disclosed. Thus, at the end of each accounting period, an income Statement and a Balance Sheet are prepared. The Income Statement discloses the profit or loss, made by the business during the accounting period, while the Balance Sheet depicts the financial position of the business at the end of Accounting Period. Further, it is to be noted that this concept is also necessary for the allocation of expenses between capital and revenue. That portion of capital expenditure, which is consumed during the current period, is charged as expenses to income statement and unconsumed portion is shown in the balance sheet as an asset for the future consumption. However the businessman/users of financial information desire to know the results of the operation and financial position at appropriate time intervals. Therefore, the life of the business is divided into appropriate segments/time interval. Each segment/time interval is called as Accounting period. Normally the Accounting period is “one year” [12 months]. Any period can be selected as Accounting Period depending upon the convenience of the business or as per the business practices in country. Accounting attempts to present the gains or losses earned or suffered by the business during the period under review. According to this principle – All the revenues should be recognized when they are earned, not when they are received in cash, and Similarly, the expense should be recognized when they are incurred, not when they are paid this concept is based on the matching concept of accounting. For example, suppose a building is taken on rent for the purpose of business on 1st February. The financial year ends on 31st December. In such a situation, as per accrual, the total rent for eleven months should be shown in the profit and loss account, irrespective of the actual amount paid for rent during the year. ë REMEMBER Accrual Concept is one of the Fundamental Accounting Assumptions. All income and charges relating to the financial period to which the financial statements relate should be taken into account, regardless of the date of receipt or payment. Income should be accounted on earned basis and not on receipt basis. Expenses should be accounted on incurred basis and not on paid basis. This concept deals with the problem, when the revenue should be recognized?” According to this concept, the sale should be recognised at the point, when the property in goods passes to the buyer and he becomes legally liable to pay and other income is recognised, when they accrue. Mr. A place an order with Mr. B for supply of certain goods, which are yet to be manufactured. On receipt of order, Mr. B purchases raw materials employs workers, produces the goods and delivers finished goods to A Mr. A makes payment on receipt of goods. In this case, the sale will be presumed to have been made not at the time of receipt of the order for the goods, but at the time, when goods are delivered to Mr. A. When cash is received (Cash Sale). When the customer has become legally liable to pay the price (Credit Sale). When specific service is performed (Service contract). This concept emphasizes that profit should be considered only when realized. When profit should be deemed to have accrued? Whether at the time of receiving the order or at the time of execution of the order or at the time of receiving the cash? Answer: As per law (Sales of Goods Act), the revenue is earned only when the goods are transferred. It means that profit is deemed to have accrued when 'property (ownership) in goods passes to the buyer' viz. when sales are affected. As per this concept, only monetary transactions are recorded in the books of accounts. The transactions, which cannot be expressed in monetary terms, do not find place in the books of accounts, although they may be very useful for the business. Measurement of business transactions in money helps in understanding the state of affairs of the business in a better way. For example, if a business owns cash of Rs. 10,000, 600 kg. of raw materials, two truck, 1000 square feet of building space etc. these items cannot be added together to produce a meaningful total, what the business owns. However, if these items are expressed in monetary items such as Rs. 10,000 of cash, Rs. 12,000 of raw materials (600 kg. ), Rs. 2,00,000 of two trucks and Rs. 5,00,000 of 1000 square feet of building, all such items can be added and a better estimate about the assets of the business will be available. Some people think that the Accounting gives a full picture of business. It is never true, because in Accounting, only monetary items are recorded; no record is made for non-monetary items. Thus accounting does not give the picture of non- monetary items. It is due to this concept that: Recording in Terms of Money, Recording only Monetary Items. In accounting, only those business transactions and events which are of financial nature are recorded. To be precise, the transactions should be measurable in terms of money. Otherwise it should not be recorded. This concept has the following limitation. a) It does not give a complete account of the happenings in business unit. Example: Ü Strike in the factory Ü Sales manager is not speaking with production manager b) It is not capable of recording transactions which cannot be expressed in terms of money. Ü Employees are the assets of the organization Note: Though this concept has its own limitations, still it is used for accounting purposes, because there is not better measurement scale other than this concept. Accounting to this concept: As asset is recorded in the books at the price, which is paid to acquire it, and This cost is the basis for all subsequent accounting for that asset. For example, if a plot of land is purchased for Rs. 1,50,000 then as per this concept, the asset will be recorded in the books at Rs. 1,50,000, even if its market value at that time is Rs. 2,00,000. In case a year later, the market value of this asset comes down to Rs. 1,00,000 it will continue to be shown at Rs. 1,50,000 and not at Rs. 1,00,000. The cost concept does not mean that the asset will always be shown at cost. It has also been started above that cost becomes the basis for all future accounting for the asset. It means that asset is recorded at cost at the time of its purchase, but it may systematically be reduced in its value by charging depreciation. Advantage: Cost concept has the advantage of bringing objectivity in the preparation and presentation of financial statements. In the absence of this concept, the figures shown in the accounting records would have depended on the subjective views of a person. Drawbacks: However if cost concept is followed in the following situations, then the financial statements will not depict the true and fair position of the business:- In case of inflationary trend in the price of the assets (such as land), the historical cost does not have relevance. For example, suppose during the financial year, an asset is purchased for Rs. 50,000 and at the end of financial year, its market value is Rs. 2,00,000. In the financial statements, the assets will be shown at Rs. 50,000, which will not depict the true and fair view of the land. In case, asset does not have any acquisition value, (for example, assets acquired by the firm by way of gift), such asset will not be shown in the financial statement, if cost concept is followed, because nothing is paid for it. This will adversely affect the concept of true and fair view. According to this concept, an asset is ordinarily recorded in the books at the price at which it was acquired i.e. at its cost price. It must be remembered that the real worth of the assets changes from time to time. So, it does not mean that the value of such assets is wrongly recorded in the books. The book value of the assets as recorded does not reflect their real value. They do not signify that the values noted therein are the values for which they can be sold. Though the assets are recorded in the books at cost, in course of time, they become reduced in value on account of depreciation charges. The idea that the transactions should be recorded at cost rather than at a subjective or arbitrary value is known as Cost Concept. This is based on the Accounting Period Concept. The main object of running a business is to each profit. In order to ascertain the profits, made by the business during a period, it is necessary that’ ‘Revenues’ of the period should be matched with the ‘Cost or Expenses’ of that period. The effect of this principle can be summarized as follows: (a) When an item of revenue is entered in the profit and loss account, then all the expenses, incurred to earn that income (whether paid or not) should be entered on the expenses side. (b) When some amount is spent in the current year, and the income against it will be earned in the subsequent years, then the expenditure should be shown in the subsequent years, when the income is earned. It is due to the concept that necessary entries are made for outstanding expense, prepaid expenses, accrued income and unaccrued income in the books of accounts. As per this concept, all expenses matched with the revenue of that period should only be taken into consideration. If any revenue is recognized, then expenses related to earn that revenue should also be recognized. This concept is based on accrual concept as it considers the occurrence of expenses and income and do not concentrate on actual inflow or outflow of cash. This leads to adjustment of certain items like prepaid and outstanding expenses, unearned or accrued incomes. It is not necessary that every expense identify every income. Some expenses are directly related to the revenue and some are time bound. According to this concept, the accounting data and accounting information should be verifiable and free from personal bias. For example, in the case of Fixed Assets, the amount can be verified by purchase bill etc. They should be objective (out of one’s mind), not subjective (of one’s mind). However, there are some areas in Accounting, where evidence cannot be available to verify information and where estimations are made. For example, the estimation of depreciation, estimation of Bad and Doubtful debts, etc. These estimates should be free any bias and should be based on reasonable analysis. In the example given above, if the furniture worth Rs. 50,000 is purchased, the situation will be as follows: Capital (Rs. 1,00,000) = Cash (Rs. 50,000) + Furniture (Rs. 50,000) Thus, this concept develops a relationship between liabilities and assets. The Accounting Equation can be technically started as “for every debit, there is an equivalent credit”. As a matter of fact, the entire Double Entry System of Book-Keeping is based on this concept. Dual aspect principle is the basis for Double Entry System of book-Keeping. All business transactions recorded in accounts have two aspects. One is debit aspect and another one is credit aspect. For every debit, there must be an equal and corresponding credit. Now look at the following for Dual Aspect Concept.